1.0A human being’s ‘life journey’ is a ‘living tree’. This ‘living tree’ has deep roots within oneself: as strong the roots, so strong the tree. Such a living vibrant tree produces fruits in abundance. This ideal of life as having deep roots within oneself and bearing abundant fruits for self and others outside, is reflected in the metaphor “Tree of Life”. 2.0A strong and vibrant tree is one which has deep roots. The depth and range of its roots gives it the capacity to withstand physical shocks (wind / storm), ups and downs (periods of drought where water availability goes down), and even the load it can bear. Similarly, a human life which is similarly rooted in “strength”. The deeper one’s own strength (inner strength, mental strength, and even physical strength) the greater is one’s capacity to bear shock and greater one’s capacity to draw strength and nourishment from within, in good times and bad. 3.0 The fruits of the tree are based on how well nourished is the tree and how stable it is. The more well nourished the tree, the more are its fruits. Similarly, when a human being finds all nourishment from his her intrinsic “strengths” or “capacities”, then such a human being is able to lead a life that bears great fruits for self, family, and society. 1.0 What is a successful life? A successful life may be defined as a “fruitful” life. 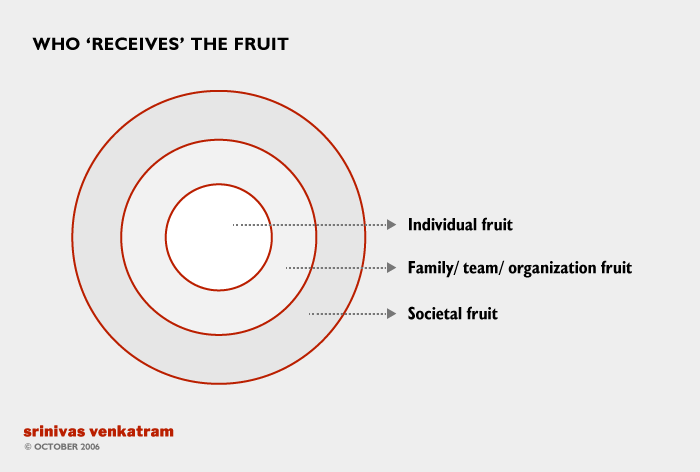 When one’s efforts, struggles, and experiences lead to an abundance of fruits – for self, for family, and for society – then such a life journey may be termed as fruitful or successful. 2.0 What do these fruits constitute? At the outermost level, in terms of economic prosperity, material goods, access to facilities like education, etc. At the second level, in term of happiness and trust in inter-human relationships with ‘social’ and ‘personal’ values like friendship, loyalty, trust, mutual respect, etc. being manifested. At the third level in terms on one’s own sense of fulfillment, learning, sense of growth, challenge, etc. a) Fruits are not only financial or material in nature. A fruitful life may be said to be one that yields happiness and fulfillment not only for oneself, but also in the context of the inter-human relationships in which we are engaged (both at home and at work), as also in the context of the larger society we live in. b) When we work hard, contribute in economic production and wealth – then the wealth so created for self and society may be termed as fruits. c) When we are creative, develop new solutions, create or invent new things which lead to the welfare of people around us – may be by saving their time, improving their efficiencies, enhancing their leisure, – then that too may be termed as fruits of our work. d) When we serve people in distress, perhaps be of physical help during a crisis for the community (like floods or riots) or during a crisis for an individual (maybe a medical one) then too our life maybe said to be producing fruits. e) When we study, develop new knowledge, add to the sum of learning in society, then that too may be termed as fruits. 4.0 Fruits then in this personal sense, mean all the signals of a productive and happy person, team, family, or community manifest. 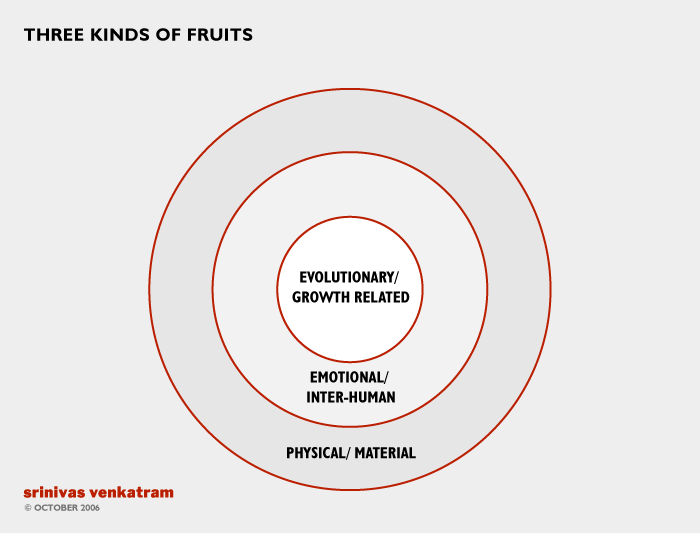 1.0 “Personality as Strength” is the basis or foundation from which all fruits are derived. 2.0 This view of “personality as strength” is based on the capacity-potential of a human being. 3.0 “Capacity-potential” means a possibility in the human being that has begun to manifest or can be seen to be readily manifest with a little effort and direction in the right quarters. 5.0 Personality is defined as the sum-total of “capacities-potential” seen in the individual. 6.0 How is “capacity-potential” different from “capabilities”? Capabilities imply known strengths, weaknesses, qualities and talents in the individuals. Capacity-potential implies “possibilities” or “potential to manifest” in an individual. The former takes a static view of the individual, assuming the individual to have been born with a set of qualities and “capacities”. The latter takes a dynamic view of the individual, assuming the individual to be constantly becoming/growing. Capabilities are measured in terms of comparative assessments (e.g. can sing well… implying, in relation to, others who cannot sing as well). Capacity-potential is measured in terms of possible end states (e.g: is capable of being a radio-singer… implying his or her capability to meet a set of relatively absolute standards). 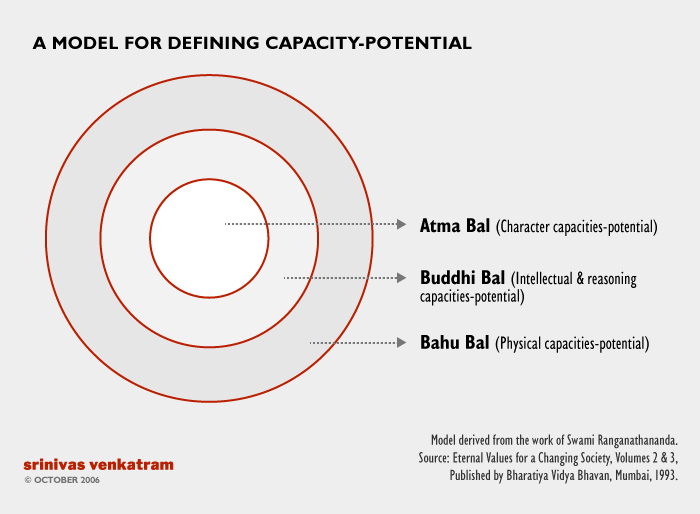 7.0 This “capacity-potential” we call “possibilities” inherent in the individual. 1.0 Strength is the capacity to manifest the possibilities inherent in oneself. More strength means more manifestation of possibilities. Less strength means less manifestation. 2.0 Physical possibilities imply what a person can do or achieve or realize on a “physical plane”. Climbing mountains, working long hours, resisting disease effectively, all come under this category. 3.0 Intellectual possibilities imply what a person can realize on the “plane of thought or ideas”. Inventing new things, discriminating between alternates, composing music, writing poems, developing new business ideas, singing classical music, all come under intellectual possibilities. 4.0 Character possibilities imply what a person can realize on the “plane of human character/ man’s truth-seeking urge”. Speaking the truth, being loyal, acting with integrity, resisting temptation, displaying diligence and discipline, regulating ones daily life, all these come under character possibilities. 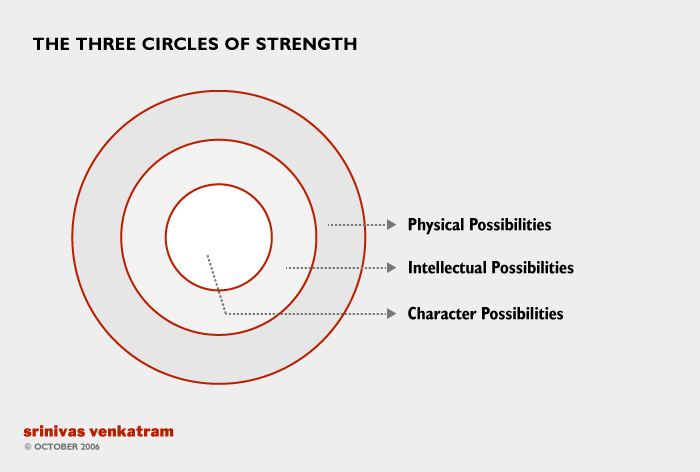 5.0 The three circles of strength or the 3-Balam Model, represents a positive attempt to help a person explore these planes of possibilities and recognize for himself or herself – potential strengths and areas of improvement. 6.0 Why is this model so important? Because it offers us two important ways forward: One, it allows us to isolate and highlight one’s own strengths and focus on them clearly; and two, it helps us recognize what “combination” of possibilities are necessary in a person to accomplish a specific life goal. It allows us to ‘recognize’ and ‘leverage’ individuals’ uniqueness better. 1.0 Personality when seen as talent or looks or specific competencies, is extremely limiting to the individual. It makes us feel that much of what we are and do, is “god given”, and that we have little or no freedom to become newer and more effective human beings. This view results in “personality development programs” focusing on what appears to be the only degrees of freedom open to an individual – which are speaking better, dressing better, and behaving in a more ‘polished’ way. 2.0 In reality, such measures, while useful if the person is already endowed with much of all that is needed in a situation, end up way-laying us in our journey of growth and evolution. 3.0 An alternative view is to see personality as the “possibilities inherent in the individual”. 4.0 Such a view makes the individual wider, more flexible, and far more capable of change and growth. Furthermore, it prevents us from ‘slotting’ individuals into narrow characteristics and ensures that we take a positive, “expansion” view of the human being. 5.0 This view opens us to the notion of “conscious development of personality” – which means: “Can each individual become aware of his or her possibilities and consciously grow and manifest some of the possibilities inherent in himself or herself”. One, that possibilities are infinite but the time and space needed to manifest the possibilities in a single life are limited. Two, that these possibilities, when seen as sub-serving or enhancing the person’s own desire for fulfillment, become positive, specific and directed. Three, the person’s own desire for fulfillment is best realized when the individual shapes his or her life consciously around a noble or high ideal. Without an ideal, all development is haphazard and not self-reinforcing. 2.0 For example, the cluster of possibilities inherent in the making of a great scientist are different from the cluster of possibilities inherent in the creation of a large business, or even the creation of a great book may be very different. 3.0 While all three may have common points, a person who “flits” from one set of possibilities to another, may develop a number of them, but may, in the final analysis, be lacking in human fulfillment. 4.0 In this context, it is essential that every individual freely chooses and learns to dedicate his/her life toward a comprehensive and integrated ideal that harmonizes all these types of possibilities leading to deep fulfillment for self and those we live and work with. Previous Previous post: How to evolve our identities?